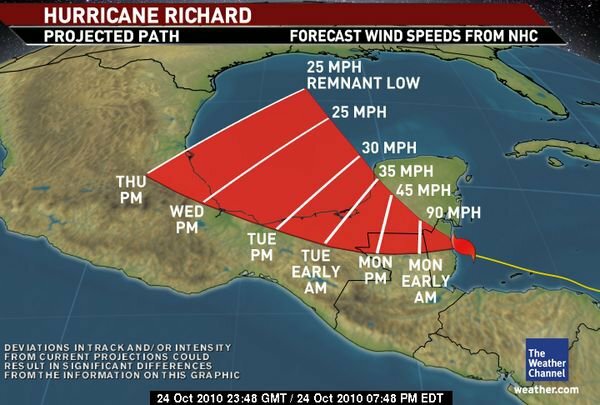 Hurricane Richard slammed into Belize at approximately 6 in the evening today as a Category One Storm. Most of the hurricane effects are being felt on the coastal areas of Belize and approximately three thousand people including tourists are in shelters countrywide. Hurricane Richard has caused extensive damage so far, downing trees, power lines closing down roads and highways and destroying houses. All of Belize is without power. Electricity was first lost in the entire southern Toledo District from 5 pm local time. This was followed by Belize City, then Western and Northern Belize. Electrical power was lost in the Belmopan, capital of Belize at 7:30 p.m tonight as the government earlier this year had decommissioned the capital’s backup diesel generating station. All cable stations stations are offline now due to the power outages. The only media online at time are Love FM (radio) and Belize.com (web) both running on independent generator and internet service. At 9 pm local time Richard is crossing Belize approximately 10 miles south of Belmopan with ferocious winds and rain and the city is in utter darkness except for a few embassies and private businesses that have their own backup generators for critical communications needs. One commentator on radio stated it must be frightening to be enduring a hurricane in darkness – especially for folks in low income homes or in shelters that do not have backup power. Thank you, for the update on the hurricane. I have family still living in Belize, I pray that the damages is not that Severe and electricity will be restored soon. Thanks Linda. Your efforts are appreciated.